“One man army… Against all… Kick… Punch… Fly… Repeat” – these words flash on screen during the trailer of Baaghi 2. “Kick… Punch… Fly… Repeat” was the formula that turned Baaghi Part 1 into the blockbuster it became for actor Tiger Shroff in 2016. Part 2 regurgitates the nuts and bolts of the template, retains Shroff in the cast and adds all-pleasing clichés into the mix. A bow to the ongoing chest-thumping nationalist discourse in India – check. Stylised action centred around Shroff – check. Romance with pretty girl to soften the blows – check. Pretty girl soaking in the rain to establish her vivacity a la Shraddha Kapoor in too many of her films – check. Heroine accusing hero of chasing her though he is not, in deference to male audience members who feel that is precisely what all women do – check. Heroine saying “I hate stalkers”, I suppose in deference to feminists in the audience put off by the aforementioned scene – check. Heroine pretending to be irritated with hero though she is not – check. Songs to lighten the mood when the going gets intense – check. Villain dancing in darkened den with ‘item’ girl – check. Excuses in the plot that allow Shroff to take off his shirt and display an impeccably muscled, painted-up torso – check. Hero’s shirt ripped off in the final fight – check. There are moments in Baaghi 2 that are so trite and so dated, it feels like a 1970s-’80s assembly-line product. The shirt-stripping, of course, is a 21st century Bollywood trope that was fun when it started but is now becoming tedious in the hands of unimaginative directors. And Baaghi 2 is nothing if not unimaginative and bland. The film opens with an attack on Neha (Disha Patani) by two masked men while she is seated in her car. For the record, Patani here looks uncannily like Shraddha Kapoor who played the joint protagonist of the previous Baaghi. Cut to two months later, and we meet Ranveer Pratap Singh a.k.a. Ronnie (Shroff), an Army man stationed in snow-laden, mountainous territory. Ronnie is introduced as an upright, no-nonsense fellow who tied a civilian to a jeep and paraded him around the area as retribution for stone throwing and disrespect to the national flag. The reference is obviously to the real-life Major Leetul Gogoi who, last year, used an innocent civilian, Farooq Ahmad Dar, as a human shield tied to his jeep while he drove through several Kashmiri villages. The state human rights commission declared Gogoi’s act illegal, and there is no evidence till date that Dar was guilty of any crime that day, but the team of Baaghi 2 clearly does not care for facts since pandering to majoritarian sentiments has yielded box-office results for other Bollywood films in recent years. The weird part is that this intro is just an aside in a film that is primarily about Ronnie’s link to Neha. We soon learn they were in love in college, and that four years earlier, she had broken off their relationship to marry a man of her father’s choice. In the present, the Goa-based Neha seeks Ronnie out in desperation when her four-year-old daughter is kidnapped. Ronnie takes leave from work to help her, but is soon flummoxed when everyone around her, including her husband Shekhar Salgaonkar (Darshan Kumar), insists that she does/did not have a child. The pre-interval portion of Baaghi 2 remains suspenseful as we grapple with the mystery of the missing girl. Unless you have already seen the 2016 Telugu film on which it is based – Kshanam directed by Ravikanth Perepu, starring Adivi Sesh and Adah Sharma – there are questions that hold attention for a while. Is Neha mentally disturbed? Does little Rhea exist? The addition of a string of promising supporting characters revs up the proceedings. There is the cynical DIG Ajay Shergil (Manoj Bajpayee), the eccentric ACP Loha Singh Dhull a.k.a. LSD (Randeep Hooda), Neha’s drugged-out brother-in-law Sunny Salgaonkar (Prateik Babbar) and the well-meaning car dealer Usman Langda (Deepak Dobriyal). They offer hope especially since Bajpayee, Hooda and Dobriyal are vastly superior artistes to the gym-manufactured leading man. Soon though it becomes evident that director Ahmed Khan and his writers (story adaptation: Sajid Nadiadwala, also the film’s producer; screenplay: Jojo Khan, Abbas Heirapurwala and Neeraj Kumar Mishra) have bitten off more than they can chew. The action becomes almost robotic post-interval, the narrative cold, and the effort at clever dialogue writing is laughable as the film drones on. The stunts that start off as worthy of wolf whistles lose their lustre soon enough. There is only so much that style can achieve when substance is absent. Santhana Krishnan Ravichandran’s camerawork is completely uninspired even as the film travels through beautiful locations. 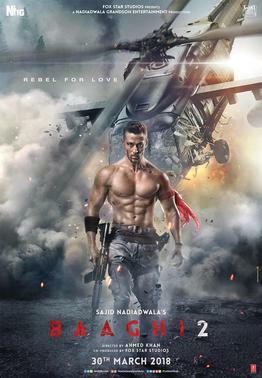 His charisma can do little for Baaghi 2 by its second half though, when scene after scene is rolled out so lifelessly that even the usually fantastic Deepak Dobriyal ends up sounding unwittingly comical when he says, with reference to himself, in a particular tragic moment, “Hyderabad is not known just for biryani, it is also known for qurbani (sacrifice).” Tee hee. That sentence, by the way, is the writers’ transparent effort to offer up a ‘good Muslim’ in the script to counter the initial pandering to Islamophobia and anti-Kashmiri-Muslim sentiment in the opening scenes. Ronnie in Baaghi 2 is meant to be some sort of profound metaphor for the Army and the battle of nationalist versus anti-national forces. I realised this in the closing moments, after the secret of Rhea’s disappearance is revealed to be a damp squib and the villains have been vanquished in this seemingly personal enmity, when Ronnie’s army boss pops up to bellow the words, “The war is over. The war is over.” More unintentional hilarity, I say. The much-discussed Ek Do Teen redux is the least of Baaghi 2’s problems. The music and Jacqueline Fernandez’s dancing do not deserve the condemnation they have received in response to the song video released earlier, but the overall effect is unexceptional enough in comparison with the original featuring Madhuri Dixit to make you wonder why they bothered to redo it. At the heart of this film’s tribulations lies Tiger Shroff. The young star’s nice-guy vibe and labours at the gym are unmistakable, but can do little to make up for his blank face. Given that, and the fact that the stunt choreography has nothing new to offer (unlike the inventive use of Kalaripayattu in Baaghi), Baaghi 2 is an all-out insipid affair. Tiger Shroff is just one of many passionless ingredients in this passionless film. Cautionary note: Baaghi 2 is a great showcase for the inconsistent track record of India’s Central Board of Film Certification. Limbs and necks are broken with gay abandon throughout and at one point the camera focuses on DIG Shergil poking a finger into a fresh bullet wound on Ronnie’s body. Yet this film has been awarded a mild UA rating while others are routinely banned, chopped and/or given A certificates merely as punishment for being realistic.